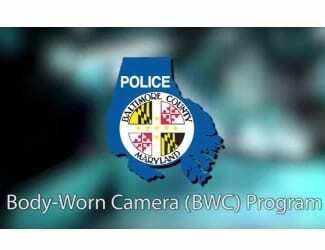 The Baltimore County Police Department’s body-worn camera program is set to begin Wednesday, July 6. The first 10 cameras will be deployed that day to one officer in each of the county’s 10 precincts. After that, BCoPD will train 10 officers a week for 15 weeks, until 150 cameras are deployed. These 150 cameras will be distributed throughout the 10 precincts and in other units where the Chief of Police has deemed camera use appropriate. This comprises the first phase of BCoPD’s body camera initiative. The second and final phase of the program, involving 1,285 cameras, is scheduled to begin in July, 2017. The program will be fully phased in by December, 2018. When complete, 1,435 of the county’s 1,900 police officers will wear cameras. County Executive Kevin Kamenetz and Chief Jim Johnson, along with Baltimore County State’s Attorney Scott Shellenberger, conducted a press briefing on Thursday at the Public Safety Building in Towson providing details about how the cameras will be used, how footage will be managed, limitations of BWCs and the anticipated benefits. Regarding prosecutions, Shellenberger said footage from citizen-operated and surveillance cameras already plays an important role in prosecutions; BWC footage – which shows police activity from the officer’s perspective – promises to be another valuable prosecutorial tool. At Thursday’s briefing, Chief Johnson highlighted the most important components of the body camera Use Policy. Officers assigned body cameras will activate them as soon as possible unless it is unsafe, impractical or impossible to do so. Officers have discretion to activate the camera during any legitimate law enforcement activity if they believe recording may be appropriate. They have discretion to de-activate the camera in places or situations where there’s a heightened expectation of privacy (e.g., locker rooms or rest rooms). They also have the discretion to de-activate in order to secure statements from witnesses and victims. Officers will notify people as soon as possible that they are being recorded unless it’s unsafe, impractical or impossible to do so. Civilians cannot choose whether or not they are recorded. Retention periods for footage depend on the type of incident. For the least serious incidents, the retention period is 18 months. For the most serious felonies, the footage is kept permanently. BWC footage is a public record subject to release under the Maryland Public Information Act and other relevant laws to the public, including media. Baltimore County will treat requests for footage the same as requests for any other police record. The same exceptions apply. Footage of incidents in which there is a compelling public interest may be posted to official Police Department platforms. An eight-year, $12.5 million contract with Taser International, Inc. includes purchase of the Axon Flex camera (BCoPD offers officers a choice of camera mounts), maintenance, unlimited data storage, licenses and other expenses. These costs will be paid with revenue from the County’s speed camera program. When fully implemented in FY2019, the ongoing annual maintenance cost of the cameras will be an estimated $1.6 million. The speed camera program will cover the cost of police personnel needed to run the program – about $1.1 million. The remaining $500,000 of the personnel cost will be covered by the Office of Information Technology and the State’s Attorney’s Office.